Directions | Dr. Leang Kim Eap, ND. Dr. Leang Kim Eap, ND. - Go South on Park Road, towards Tyvola Road. - Pass Park Road Shopping Center on the left and cross Woodlawn Road. 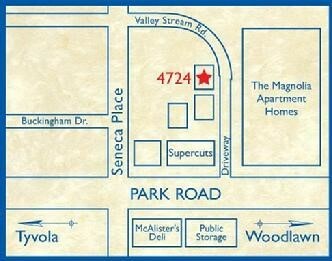 - Pass another stop light, turn into the parking lot of SUPERCUTS hair salon. - Go towards the Seneca Park offices in the back (cluster of two-floor red brick buildings). - We are on the first floor of the last office, at suite B, on the right of the entrance. This is the back way to the office. - Go North on Park Road. - Cross Tyvola Road, at the 2nd stop light turn left on Seneca Place . - Turn on the next right on Valley Stream Road. - Go around the curve into the Seneca Park offices (cluster of two-floor red brick buildings). - We are on the first floor of the first building, at suite B, on the right of the entrance. - Take Exit 6A to Woodlawn going East towards South Blvd. - At the 5th stop light, turn right on Park Road. - Pass 1 stop light, turn into the parking lot of SUPERCUTS hair salon. - Go towards the condo office in the back (cluster of two-floor red brick buildings). - Take Exit 5 to Tyvola Road going East toward South Blvd. - Turn left on Park Road. - At the 2nd stop light turn left on Seneca Place Turn left.